Were Kia's personal items sent back to next of kin? Weird question I know but If they were, How and what kind of things were sent back? Where possible yes - sometimes, where it was not practical, items could be disposed of locally and the cash value raised returned to the family. 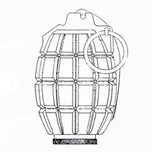 The effects were gathered and sent back via the base in France and then back to the UK for distribution. Usually it was small items that were returned - watches, books, bibles, jewellery etc. Thanks for the quick reply, would private purchase type items be returned if possible as well? Yes they were. Unfortunately since few soldiers' records survive, few lists survive - indeed even fewer than records which survive. I suspect that a lot of lists were weeded out over the years. I don't have my lists to hand but I can remember things like photos, letters, packs of cards, postcards, a masonic directory. I don't remember a watch, but in my earlier thread other forum members said they had seen watches. I've been going through a boer war order book, and there it notes two deaths. On both accounts an auction was held of personal items to raise funds for the grave stone. I can imagine by the Great War sending items back from France and Flanders was relatively simple, but some fronts such as Mesopotamia would prove more difficult, so would they have disposed of personal effects locally. Vera Brittain writes of her fiancé Roland Leighton’s personal kit being sent back via Cox’s. She describes in some detail the bullet hole in his tunic and waistcoat stiffened with blood and mud. His father hurried away his watch and other small items for no one ever to see again. It’s a stark few paragraphs that conjures the horrors and grim realities of war. This form is included in my great uncle’s service record, showing personal effects returned to his parents. I had never noticed till today because of this thread the date. He died in hospital at Rouen in May 1918. 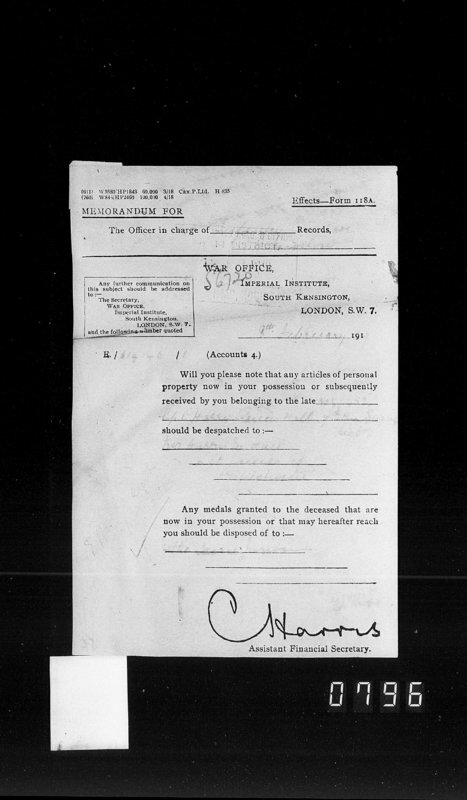 The forms are dated 15 Feb 1919. Seems a long time between death and being returned. Effects weren't returned until all the other paperwork was sorted. There is an army form, can't recall which one though, which specifically confirmed it was ok to go ahead and release the effects to the relatives. Dogtag returned to the family of Robert Pegg, 20/1112 - 243182. 1/5th N.F. Officer's families often sought the return of swords. Symbolic of a fallen warrior perhaps? Thank you Andrew, that’s brilliant. I will add it to my file on Harry. I attach a photo of a couple of labels that were attached to the personal effects of 5704 Pte W. Gibney of Gympie, Qld, who was KIA with 1st Btn AIF 5/11/16 and who is commemorated at VB. A list if items was sent too and consisted of a Bible, postcards (of Ypres) and sundry items such as these. 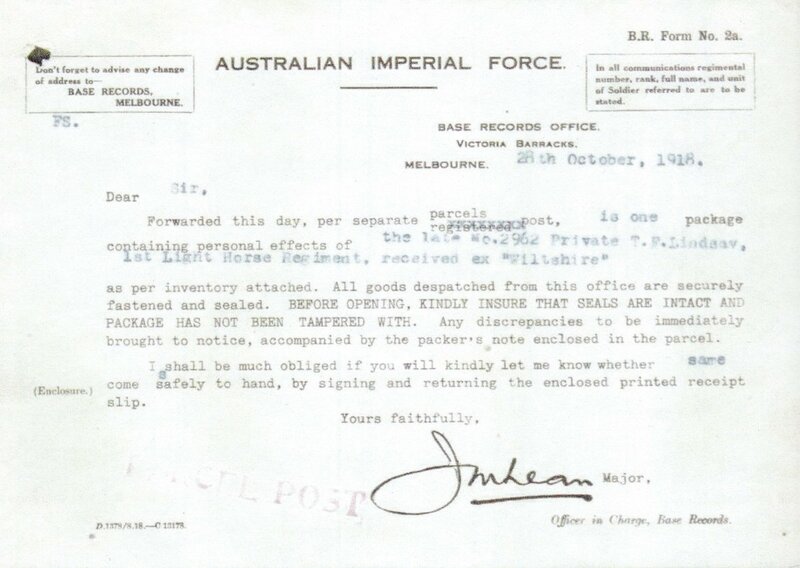 I also recall reading the papers of the McCrae family many years ago at the AWM and the father of Major Geoff McCrae (60th Btn) rants about his son's kit being stolen in Egypt en route from F&F to Victoria. Without digging out my notes I am pretty sure it included his sword. 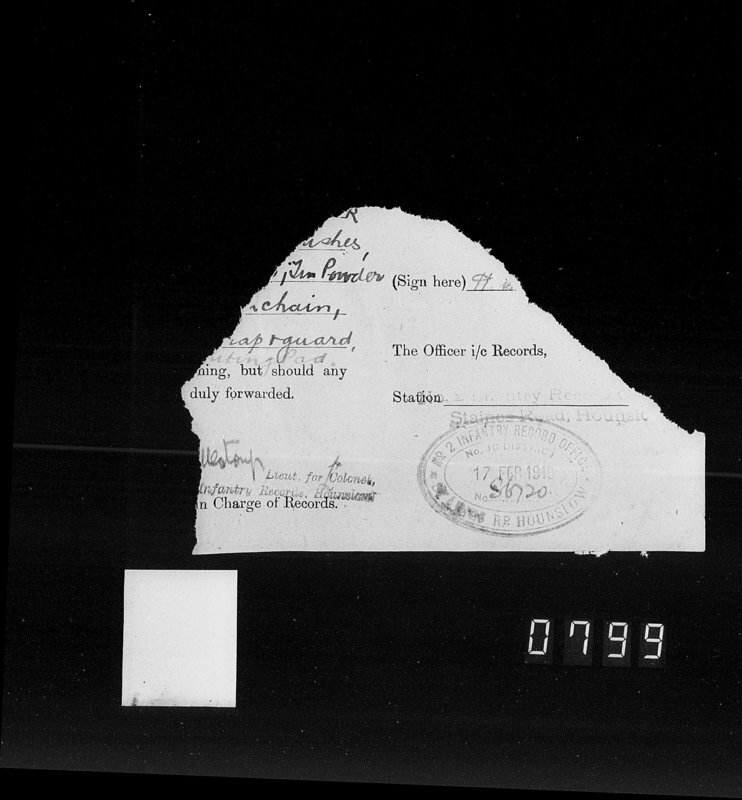 Many of the AIF personnel files include the list of contents of each of the various parcels sent to the listed next-of-kin of deceased soldiers. 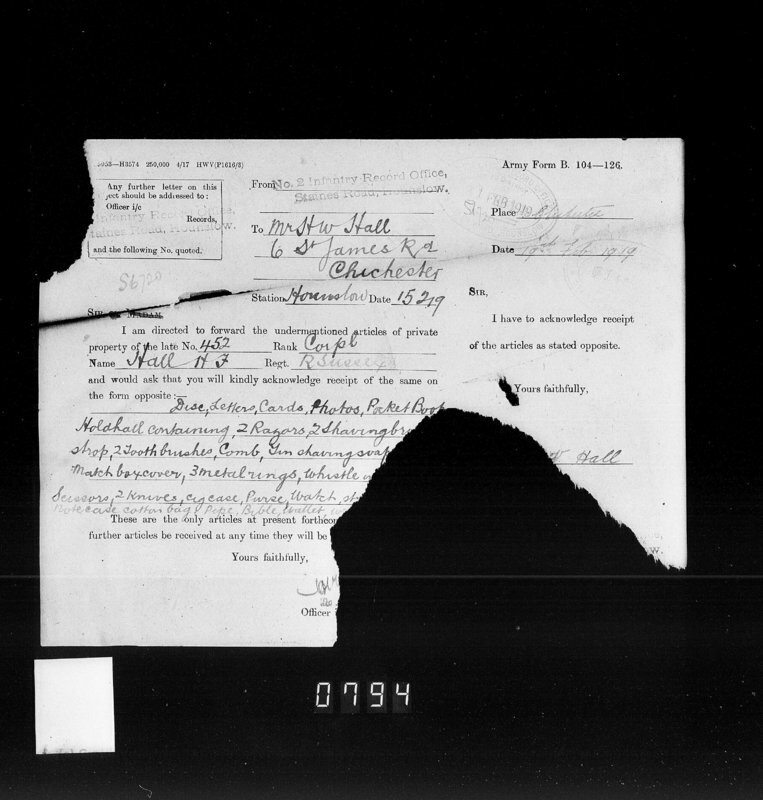 The associated paperwork also includes the ship the items were sent to Australia aboard. Some lists are very small, while others list a much larger number of items. The items listed are invariably personal items like letters, postcards, personal grooming items like combs, brushes, etc, but not 'issue kit' which was retained and returned to store. The example above, 5704 William John Gibney, shows his effects being returned to Australia in two parcels, one aboard Medic, the other on Themistocles. The receipts for these are on pages 32 and 33 of his file, and the contents are listed on pages 38 and 41. See NAA file barcode 5029603. Unfortunately, some files include correspondence concerning missing items. 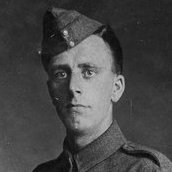 My Great-uncle, six-foot tall, 2962 Thomas Francis Lindsay was KiA Palestine on 14 Jul 1918, as a Tpr with 1ALH. 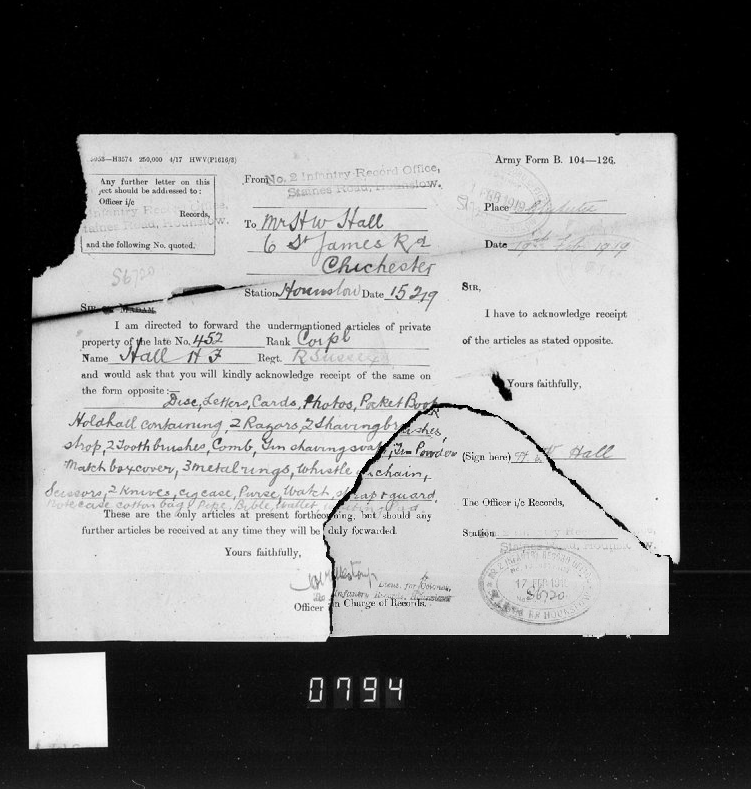 His father (my great-grandfather), was obliged to sign for packages containing his youngest son's personal effects - some of the documents attached for your general interest. Mike - thanks for that comment on AIF papers. They are indeed an excellent source and strongly recommended for anyone who has not accessed them when looking for info on AIF personnel.